New & Used Tire Rack Shelving | Ace Industrial Equipment, Inc.
is a safe and effective to store tire inventory or to display it for sale. Tire rack uses specially formed and sized angle beams creating a safe and organized system to store passenger and light truck tires. 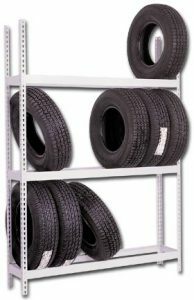 All tire storage rack is treated with a rust-inhibiting base coat, and has a gray enamel finish that is backed on for durability. For more infomation about tire rack contact us today. For Immediate Delivery and The Best Prices Available on tire rack call 1-800-300-6034 Monday thru Friday 8:00 to 5:00 E.S.T.